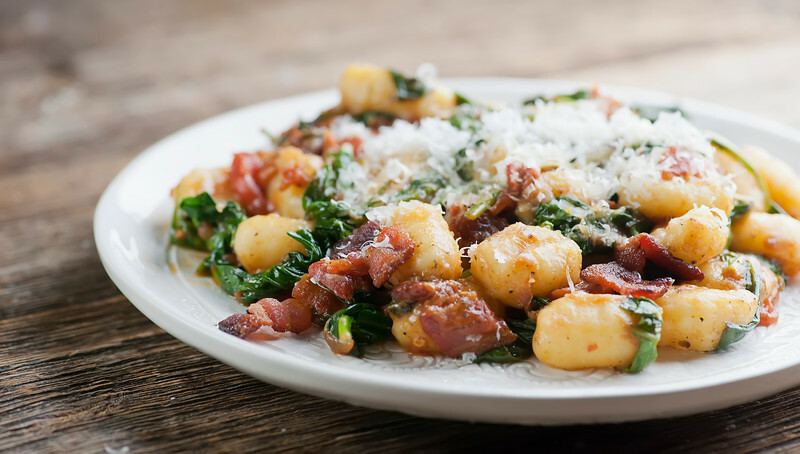 This recipe for gnocchi with bacon and spinach is so easy to make, and also lets you in on where you can buy the best bacon in the world! 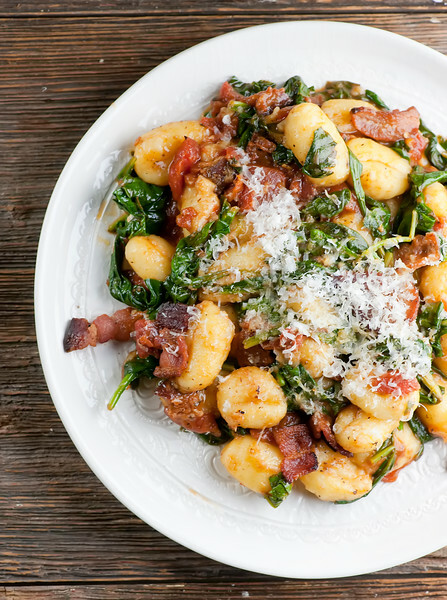 Welcome to one of my favorite pasta recipes, gnocchi with bacon and spinach. Today I’m going to tell you not only how to make this plate full of All The Good Things, but I’m also going to tell you where you can get my favorite bacon in the entire world (and if you have spent any time at all on this website in the past, you know that is a serious statement. Seeing as I have Bacon as a main category of food groups along with breakfast, lunch and dinner. As usual, the bacon has a backstory, but at the end of everything you are going to know how to make yourself a bowl of gnocchi with bacon and spinach, complete with the world’s best bacon, so hang in there with me and let’s make it! It all starts in Vermont, my favorite place on earth. 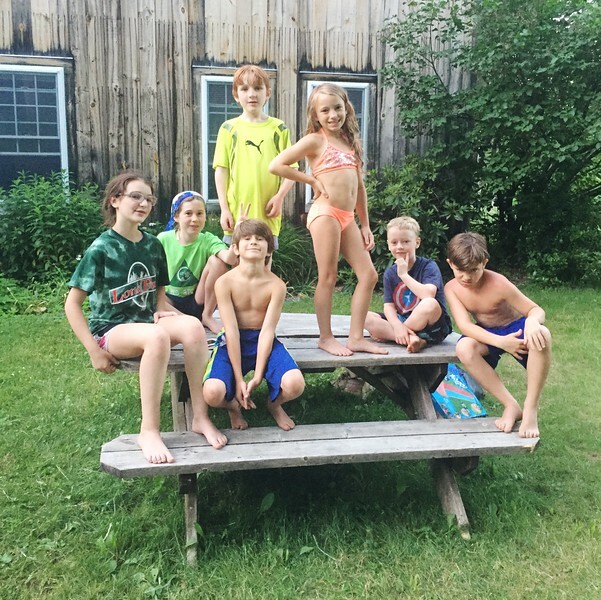 Our family’s Vermont story started in this same small town where my mama and her brothers and sister grew up, and even though my generation and our kids are now living all over the place, now and then we all find ourselves up there again all together. 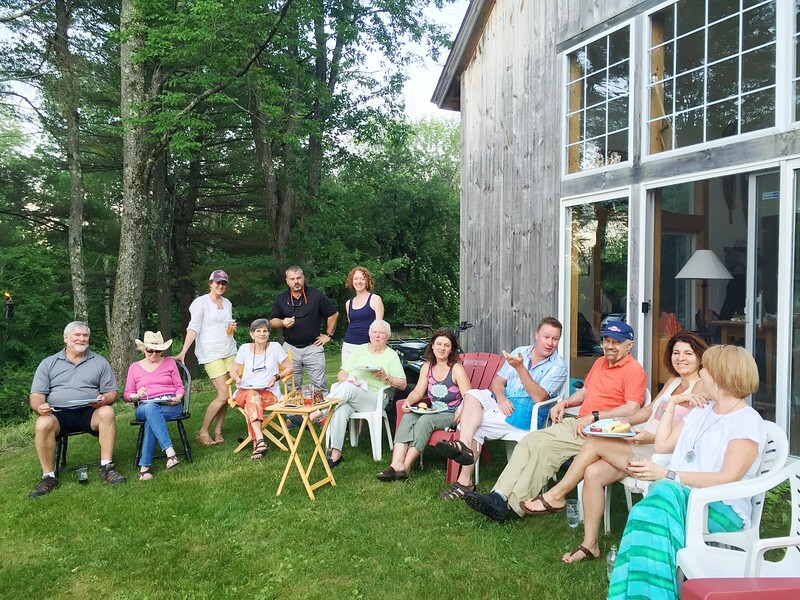 Back when I was a kid, the moms and dads and grandparents would hang out together chatting and maybe having a cocktail or two in front of the glorious Vermont view, while us kids ran around in a pack getting into all kinds of noisy mischief. Fast forward, and these days…. A new generation of mischief-makers! Some of them, anyway. …which is not to say Vermont life doesn’t have the occasional dramatic moment here and there. And needless to say, there are always lots of good eats. This is a cake that my mama and my daughter made together. 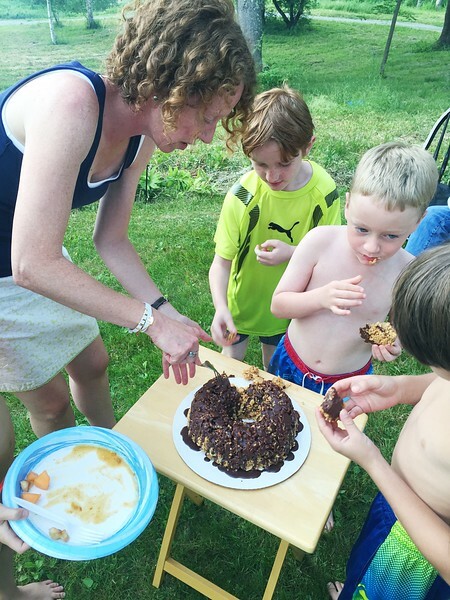 It involves peanut butter and rice cereal and pretzels and lots of chocolate, and it is one of the things that unites the in front of the house crowd with the back of the house crowd. I promise to get that recipe for you all. And of course, lots of cook-out deliciousness. 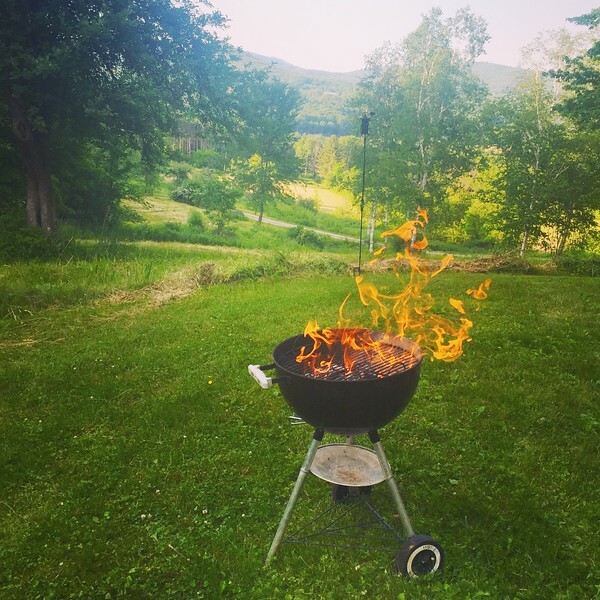 There’s nothing like a grill with a view. Which brings me to the World’s Best Bacon, which brings me to Oscar’s. 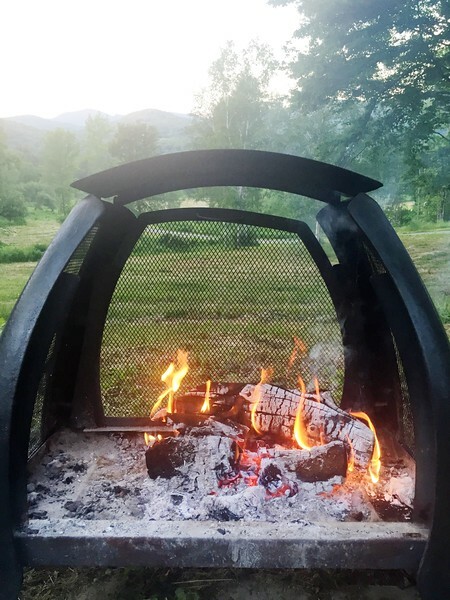 Oscar’s is a smokehouse that is on the way to/from our little Vermont town, and if that isn’t anywhere near where you live, I’m happy to tell you that you can order online from Oscar’s. However, we are lucky enough to be able to stop by in person and pick up your own bbq necessities like chicken, turkey, pork, sausage, something that they call More Than Mustard that definitely is…and bacon that will ruin all other bacon for you from now until the end of time. This time my mama volunteered to do the Oscar’s run, and so right this minute my freezer is guarding five pounds of bacon heaven. Some of which I will use before long when I make this gnocchi recipe again. I use packaged gnocchi for this recipe, which makes it super quick to put together. I’m waiting for my friend Toni, one of the best cooks I know, to give me gnocchi-making lesson, and one day That Will Happen. Until then, the packaged kind is filling in, and with all the other textures and flavors going on here, it’s just fine. I start by cooking up a mess of chopped bacon, and adding in some canned chopped tomatoes (the San Marzano kind if you can find ’em! So good!). A little sugar and balsamic vinegar and a pinch of salt and the sauce is done. Meantime, I cook the gnocchi until they are just done (and you know they are done when they float to to top. Drop some baby spinach into the gnocchi water for about 30 seconds, and then drain the whole thing and add it to the sauce. Gently toss everything around with tongs, then divide it among plates and shower the whole thing with grated Parmesan. Here’s a quick video that shows you how very easy this gnocchi deliciousness really is! This tastes best if you eat it in Vermont, but it’s pretty dang delicious no matter where you are. Especially if you are surrounded by your noisy, beautiful family! Cook bacon in a large deep skillet over medium high heat until done to your liking. Add tomatoes, sugar, pepper, and vinegar and saute for about five minutes. Meanwhile, bring a pot of salted water to a boil and add gnocchi. Cook according to package directions until gnocchi are done (usually when they float to the top). Add spinach to gnocchi and cook for about 30 seconds until wilted. Drain gnocchi and spinach mixture and add to sauce. Gently toss with tongs until combined. Divide among plates and top with Parmesan. Beautiful pictures!! And that dish looks so delicious! I have no idea why I’ve never tried cooking gnocchi before when I enjoy it so much! I’m going to make this for the hubby this weekend! Vermont looks like a beautiful place! Great pics too! 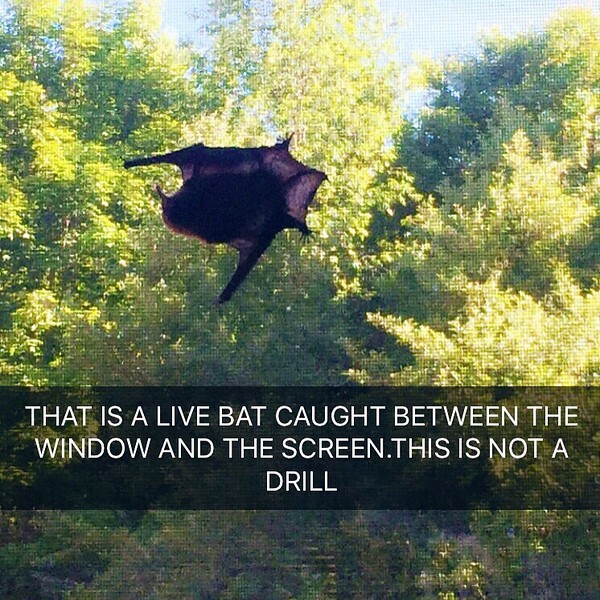 And just look at that bat!! Yikes. Those outside fire pits are so great. Nothing like sitting around them in the Summer time just relaxing and having some good food, good drinks and good company. The absolute BEST! Wow! This is such an awesome post with most beautiful pictures, Kate. Vermont sounds like an amazing place to visit. And this gnocchi looks fantastic. Looks like an awesome time was had by all Kate! (Minus the bat!) Love this pasta! Bacon makes everything better! Your motto and mine!! Sounds like you have such special memories of Vermont! I’ve never been there before, but I would love to visit some day. This gnocchi looks amazing! It’s a dish that I always order out, but have never tried making on my own. I love the bacon in here! Okay, I just went to the Oscar’s website and was faced with a bewilderment of choices on the bacon page. Applewood? Hickory? Irish? British? Do I honestly have to spend my entire week’s wages trying to find the Perfect Bacon? Or would you be so kind as to give me some hints? What a great time! And that cake looks fabulous. This gnocchi looks so delicious and comforting. I want a big bowl right now! love this dish–gnocchi has become one of my favorite meals! I feel like the dog in the tv commercial, except I’m saying: “Bacon, bacon, bacon, bacon”. This looks absolutely delicious! Can’t rate the recipe as I haven’t made it yet but it looks and sounds great. Howevet the directions don’t say anything about draining the fat out of the pan after cooking the bacon. Do you really recommend leaving all the cooked off fat in the pan to become part of the sauce? Hi Sandy! Love your addition of red pepper flakes – and any bacon is good bacon in my book. :) Happy weekend!